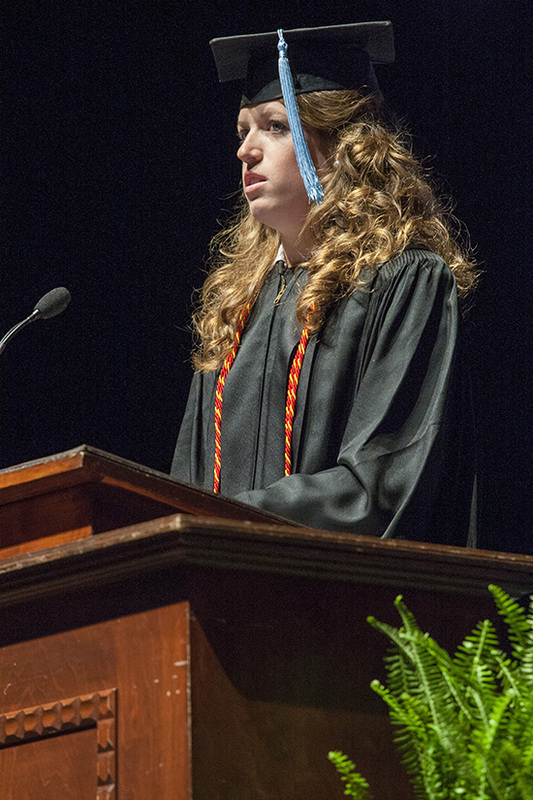 Two graduating seniors shared thoughts of faith, service, grace and relationships as Samford University's College of Health Sciences celebrated its inaugural commencement on Friday, May 16. Nursing major Anna Beth Shelton and exercise science major Megan Montgomery were chosen to speak because of their participation in mission/service opportunities and their special sense of calling to use their careers in and through mission work, said Samford vice provost Nena F. Sanders. "Samford is known for its academic excellence, but today we will focus on service and mission," Sanders said. The 203-member class includes graduates from the Ida V. Moffett School of Nursing and schools of health professions and public health. Bachelor's, master's and doctor of nursing practice degrees were awarded. Shelton told how Samford helped her to know how God wants her to live her life. After becoming a Christ follower her sophomore year, she realized that "He is sovereign over my entire life, including my career." During medical mission trips to Bolivia, the Middle East and Guatemala, where she and nursing classmates cared for malnourished infants and children, Shelton realized her dream of using her career for his glory. After graduation, the Birmingham native will to return to Antigua, Guatemala, as a missionary to live and work for two months at an orphanage as a pediatric dialysis nurse and attend Spanish language school. "God has used Samford to equip and prepare me for his mission that I am about to go on in many ways… not just as a nurse, but also as a person," she said, thanking her professors for their support. "We would not be here if it were not for your role that you played in our lives." Shelton cited Matthew 28: 19-20, in which Jesus gives power and authority and a command to go to the nations. "Your life is not your own and your career is to be used for God's glory. God has given each and every one of us unique gifts and talents," she said. "When you have seen some of the things that I have seen, have held the hand of a dying child, looked into the eyes of an orphan, seen destruction caused by war, and suffering, you are never same again. It wakes you up and changes your priorities and changes your perspective on how we should spend our lives," Shelton said, cautioning the seniors to not buy into the so-called American dream that points to worldly gain for joy and satisfaction. Glorify God in all that you do, she advised. "Ask God to make you into the Godly man and woman he is calling you to be, and you will be amazed at what God will do," she said, adding that missions does not necessarily mean going across the ocean, but can be in a more nearby workplace. Use your Samford degree to his glory, she said. Montgomery, of Rome, Ga., shared how an experience in December changed her understanding of service. A veteran of many high school and college mission trips, Montgomery said she always returned home "on fire for God," but after a few weeks would find that the "cloud nine feeling" would start to fade. She was readying for an early 2014 Samford-sponsored medical mission trip to the Dominican Republic when on December 17 her Birmingham apartment was burglarized and set on fire. Everything she owned was pile of "soggy blackened ashes." "My world had been turned upside down," said Montgomery, who recalled 1 Peter 4:10 as the foundational verse her professor Alan Jung had set for the trip: "Each of you should use whatever gift you have received to serve others, as faithful stewards of God's grace in its various forms." "His grace can be found in the good times and bad-but no matter how God's grace is presented to use, we are called to be faithful stewards and use our gifts to serve him and others," said Montgomery, who will pursue a doctorate in physical therapy at the University of North Georgia. In the Dominican Republic, teams made up of a doctor, translator and several students set up clinics in different villages where they treated several hundred people a day. Working closely with the doctors, the students helped with diagnoses, treatment plans, medications and shots. "Although we were there as a medical team, Dr. Jung reminded us that we were also there for the relationships," said Montgomery. "More times than not, I could be found with a baby in my arms or handing out stickers and playing with the younger kids." She found that the trip was different than the others she had been on. "I knew what it meant to serve those who had nothing. God put me in a place that I was able to connect emotionally with the people I was serving. Looking back, I can see that God's grace was given to me; just not how I expected it." 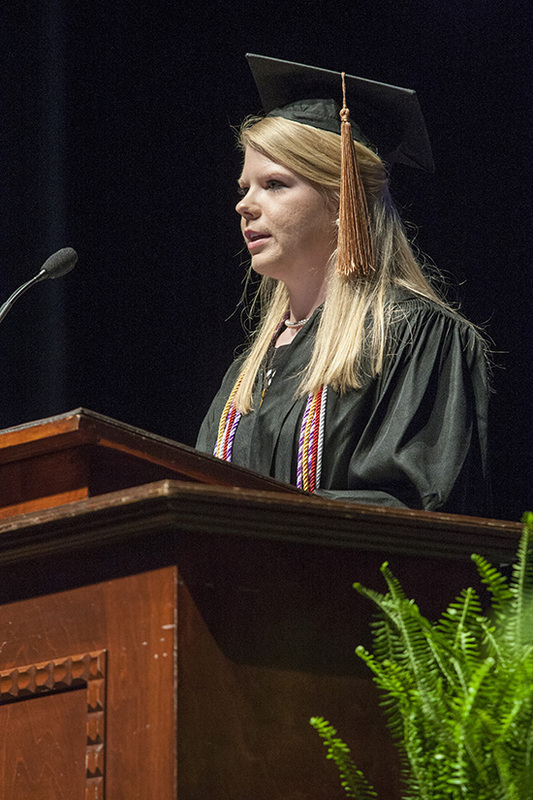 Montgomery encouraged other new graduates to remember where they came from, in order to know where they are going. "The lessons we learned here at Samford are valuable, but the relationship we made are priceless. I pray we all continue to be authentic and intentional in our relationships. If we walk by faith we are sure to enjoy the extraordinary plans God has for each of us." Samford vice provost Nena F. Sanders told the graduates that regardless of their immediate plans for further degrees or a new career, they are entering a health care world "that contains more challenges and opportunities than we have ever faced in health care." Despite what happens with the Affordable Care act over the next few years, she said, health care will never return to its previous state. "The wheels are in motion to dramatically and permanently change the delivery and reimbursement of health care." "You are going to be challenged to find new ways to provide health care services that are more readily available, more effective and more efficient to larger and more complex population groups," Sanders said. With the shift from health care interventions in hospitals to health promotion initiatives provided within the community, roles of all heath care providers are changing and expanding. "We are witnessing the emergence of new providers of care who do not have a title at this point in time. And Samford's College of Health Sciences and the schools within the college will be addressing that need." "You are the future, especially related to health care," she told the graduates, reminding them that to be successful in today's changing world, it is vitally important that they each be a "lifelong learner and catalyst for change." Samford provost Bradley Creed announced that nursing faculty member Susan Sheffield will retire after seven years at Samford, and that vice provost Sanders will step down from her role as nursing dean. Graduates included Bachelor of Science in Nursing degree recipients Dylan Phillip Lempp and Jordan B. Valdez, who later in the day were commissioned second lieutenants in the U.S. Air Force through Samford Air Force ROTC detachment 012.